Jack The Ripper tour featuring the murkier side of the capital. Join us for an Evening visiting the haunts of the demon barber Sweeney Todd and London's first and most famous serial killer, Jack the Ripper. Ghosts of London- We will show you the sinister and ghostly side of London. The house in Berkeley Square, where happenings took place, so terrifying that for most of the 19th century it was known as 'the most haunted house in London'. Hear about the Theatre Royal Drury Lane where a distressed man in 18th century attire is regularly seen striding backstage. Shudder at the tale of Sweeney Todd, the demon barber of Fleet Street, and has accomplice Mrs Lovatt who was said to have baked pies from the flesh of his victims, selling them to her unsuspecting customers. Jack the Ripper- We then venture Into the notorious East End of London, where we will follow in the footsteps of the worlds most famous serial killer- Jack The Ripper. 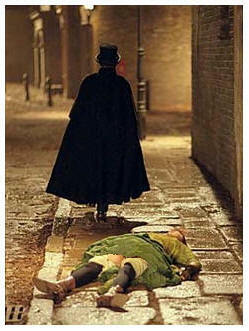 We'll visit the exact sites where, in 1888, he hunted and gruesomely murdered five London prostitutes. We visit four of the murder sites and our Ripperologist will run through the list of suspects, a true Victorian whodunit. This is a combination of coach/walking tour and will finish at a traditional pub near Trafalgar Square.